Email is a substantial part of our daily lives. As of 2011, the average user sent and received 105 email messages per day . The average office worker spends 28% of their workday on email . I received 4 email messages in the 30 seconds it took to write this sentence . 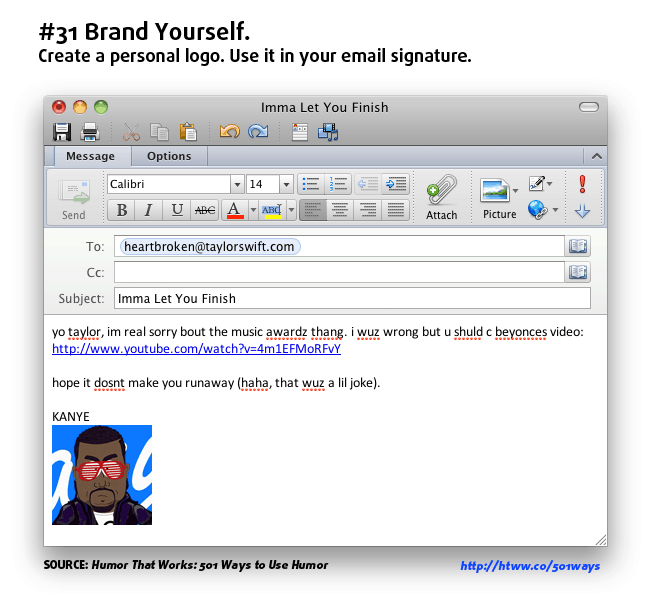 #1 – Introduce yourself through a personal brand image. We rarely actually see what the person on the other end of an email looks like. Help the other person visualize you in the way you want to be represented by using your own personal brand. 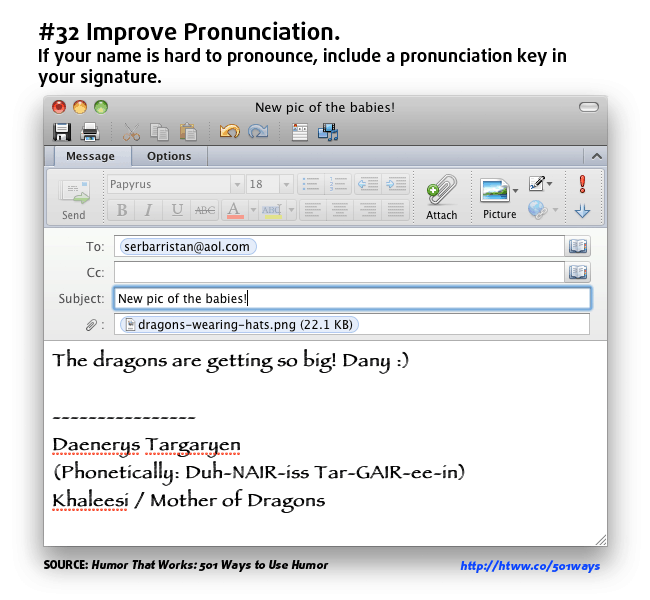 #2 – Help people say your name correctly with a pronunciation key. If you have a difficult-to-pronounce or uncommon name, your email recipients may have no idea how to actually say it. Even if you never talk to the person vocally, you can still help them subvocalize the name every time they see your email come across. #3 – Elicit a smile by including a humorous, meaningful, or inspirational quote. 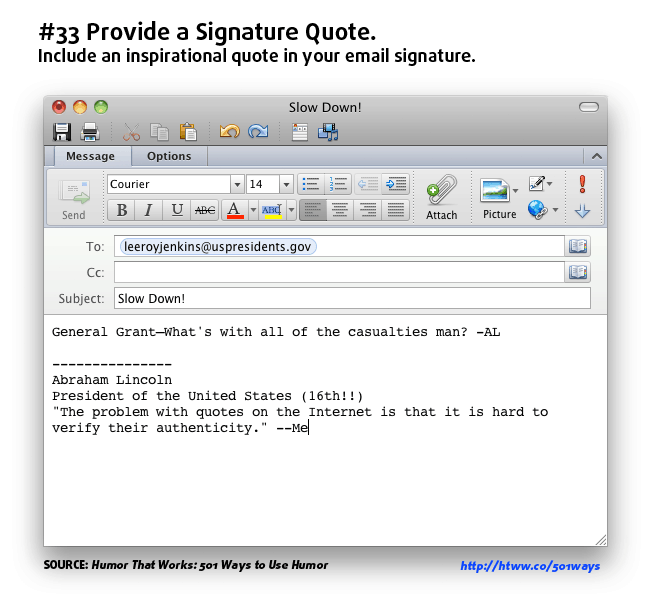 This allows you to share something funny or motivational for the people who read down to your signature. It also gives you a chance to share a little more about your personality based on the quotation you choose. 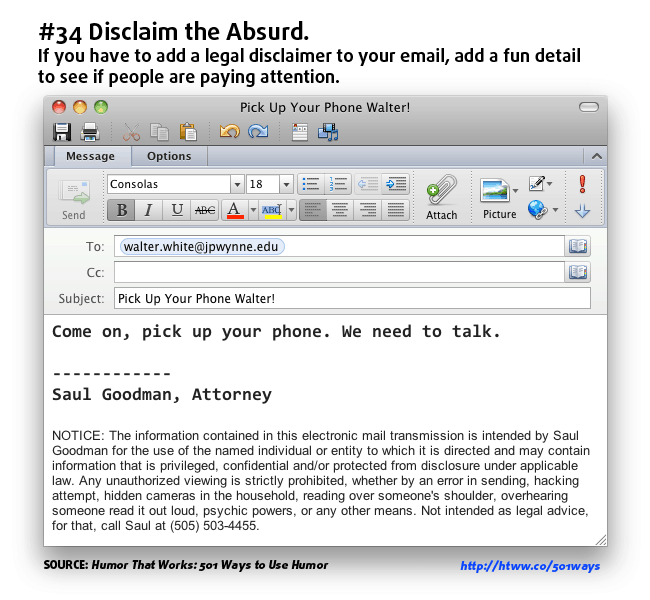 #4 – Reward the detail-oriented by hiding a few fun examples in your legal disclaimer. If your company requires you to have a legal disclaimer at the bottom of your email, add a few funny entries to your list. Concerned that you might not be taken seriously? Don’t worry, legal disclaimers are legally meaningless . Want more ideas on how to use humor in the workplace? Check out my book Humor That Works: 501 Ways to Use Humor to Beat Stress, Increase Productivity, and Have Fun at Work. Stop checking your email, now. You’re going to have to trust me on this one. All examples come from my book, Humor That Works: 501 Ways to Use Humor to Beat Stress, Increase Productivity, and Have Fun at Work. Spare us the email yada-yada.